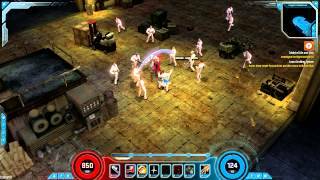 Game Marvel Super Hero Squad - is a game that comes alive comics. Here all cartoon characters to be in front of us in the deformed state. The line was designed for young collectors, but became a hit with fans of all ages, despite the comic category "of 3 and ...". In Marvel Super Hero Squad registration presented quite an unusual way. To register, you need the following: 1. Login to the game Marvel Super Hero Squad. Be sure to make sure it's real. 2. You need to enter data on the date of his birth. Unfortunately, this site is temporarily closed for technical reasons and more information about registration no. Play Marvel Super Hero Squad may each registered user. Since this is an online game - the game, the greater emphasis should be placed on a network connection, ie, make sure that you have Internet functioned perfectly and was broadband. In Marvel Super Hero Squad, you can play characters such as the Hulk, Iron Man, Wolverine and Spider-Man, and many others. As in the movie or cartoon Each character has their own abilities. What is surprising is that the characters in the game can even quarrel among themselves. Missions in the game Marvel Super Hero Squad online take a little time, anywhere from five to ten minutes. Complexity missions adjusted automatically. In the groups of characters can be up to four people. All quests in the game linked to the plot. During missions, you can not die, but you can take glasses, fine characters. In the game Marvel Super Hero Squad for free for your character develops achievement system, as well as an opportunity to build their own headquarters. In Marvel Super Hero Squad online characters cheerful inhabitants. They tend to smile, dance, pose different persons. Each dimension in the game you have to perform specific tasks, maybe even something to explore, but here you can find a lot of friends. Your character can be in a bad mood, then he smashes his office and may quarrel with the other characters. If you find out about the dangers in the Marvel Super Hero Squad, then first try to cope alone. If you are unable to fight the enemy, you can safely call for help of their friends. In Marvel Super Hero Squad online, you will be given the opportunity to assemble a collection of cards. You can also create new attacks and call for the fight of his friends. When your hero will not threaten anything, he can have fun with their friends on their territory. Your office, you can improve yourself, adding rooms, placing the plants, furniture and other accessories. Game Marvel Super Hero Squad online cares about his players and their heroes. Start playing the game and you will surely admire all the events that occur in it. Immerse yourself in the amazing and long-known world of comics Marvel Super Hero Squad!